This is simply delicious. I love to make a nice spicy sauce for our buns and top with caramelized sweet onions. This evening I served these with roasted potatoes, garlic aioli and a power green salad, which consisted of baby spinach, mizuna, chard and kale. Put all ingredients in a bowl and season with salt. Mix with a fork until smooth. Set aside, perhaps in the refrigerator. Start your barbecue. I use a briquette grill so I need to get it going first. You may use a grill pan on the stove, lightly brushed with olive oil. Heat 5 tablespoons of olive oil to a nonstick skillet and fry the onions over low heat until they are golden and sticky. Add the thyme sprigs and a pinch of salt and continue to fry stirring with a wooden spoon, for about 15 minutes until they get a little crisp. Put the ground chuck, parsley and egg in a bowl and season with salt and pepper. Remove your rings and mix well with your hands and shape into four large flat patties. The should be about 4 inches in diameter and not more than 3/4 inch thick. Grill the patties over a hot grill until they are nicely browned. Make sure they don’t get smoked and try not to allow them to dry out by cooking too long. They should be cooked through but moist and juicy. If you prefer to have a cheese burger, cover your patty with a slice of cheese and let it melt. Gouda or gorgonzola is a nice cheese to use. Place all of your condiments on the table in separate bowls. Heat the buns on the grill of a couple of seconds. Put the patties inside the buns and serve right away, letting everyone around your table make their own by adding sauce, tomatoes, lettuce and warm onions as they like. Preheat oven to 450°. Cut your potatoes into your desired shape and place in a large bowl. 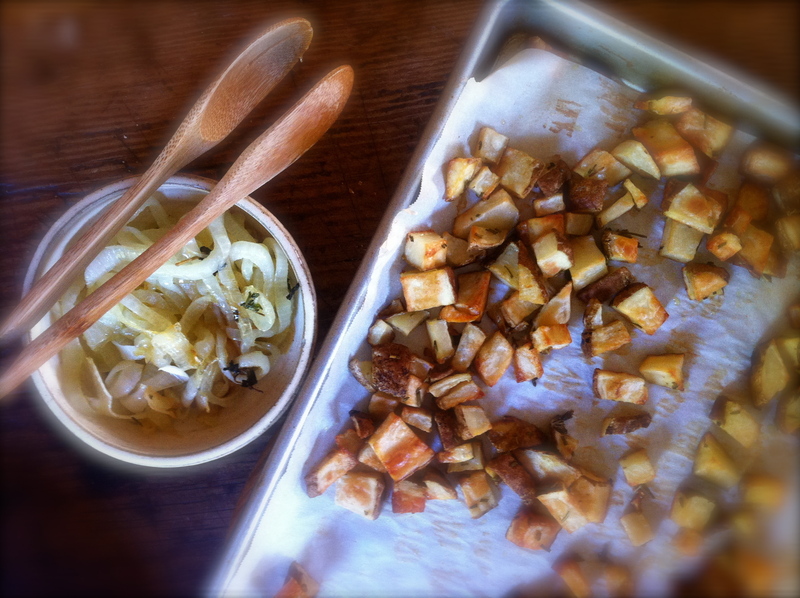 Add olive oil, rosemary, salt and pepper to the bowl and toss well to fully coat the potatoes. Place on a parchment lined baking sheet and roast until nice and brown, approximately 45 minutes. Make sure to give the baking sheet a shake now and again and turn your potatoes over for even browning. The g a r l i c a i o l i I made was a very simple version I discovered a few years back. I just use mayonnaise with a little olive oil and a few pressed garlic cloves. Sometimes I add different herbs to add another nice flavor. Mmmm, caramelized onions in a burger!! I just love the look of your pictures, with that soft/blurry edge to them. Not sure what word would best describe this effect, but in French it would be “floue”. Beautiful touch! What a very kind comment! Thank you so much Ohlidia! Oh that looks so good, I can’t wait until I’m off this diet that I started today (weeklong intense) so I can eat this burger. I love the spicy pink sauce!! It’s really hard I am living vicariously through the amazing food on the blogs. I have to tell myself the intense part lasts only 7 days and then I can go onto a modified sensible eating plan. I love caramelized onions in my burgers and this look delicious! Love that spicy pink sauce. Thank you Anne! The pink sauce really makes it….in my opinion! Ooooh, looks like a very tasty dinner! / I never knew garlic aioli was that easy!!! This is one heckuva burger! I’m a big fan of caramelized onions but I bet that spicy pink sauce really goes well here. Yum! It seriously does! I think it is the main attraction! Really turns this burger into something special. Yum! 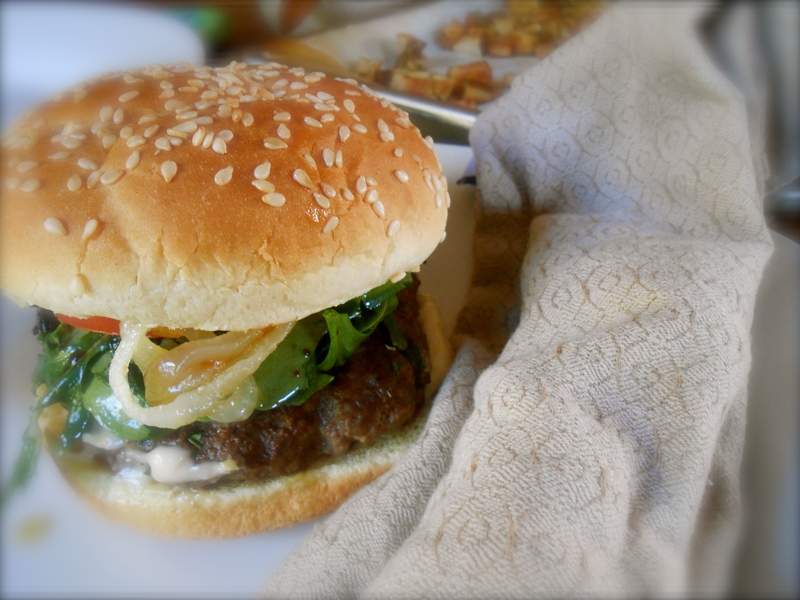 Nothing goes better with a burger than caramelised onions… sometimes I think I crave the onions more than the meat! Thanks for sharing! Glad to have stumbled upon your blog. Hi. I agree! I get a craving for the onions too. I went and explored your blog and was very impressed with your work. Thank you for stopping by. I really enjoyed your vimeo “Inspired: Frank Lloyd Wright”. Hello! Sorry, I left my previous comment with the wrong account (my art student blog instead of my food blog, which is http://www.wander-crush.com!). For some reason, it won’t let me switch over. I really appreciate that you took the time to watch the video, though! It means a lot. You food blog is gorgeous! It looks to me like it may not be a WordPress blog? Maybe that is why you can not “switch over”? Also, I could not find a way to subscribe to your food blog. I love fresh burgers and yours looks absolutely delicious! Looks so delicious. I am very intrigued by the spicy pink sauce and am looking forward to trying it! Just loving your blog and am so happy to have found it. Thank you so much! I am happy you found me too because now I’m going to go and see your site Welcome Company with Danielle! Oh Wauw, I’m skipping the Squid..I want that Burger!! Well, I was just thinking how good that squid sounded! You are currently reading caramelized onions and hamburgers at COTTAGE GROVE HOUSE.